Kids heading down the slide headfirst, babies talking gobbledygook in the sandpit and a golden retriever bounding past with a stick in its mouth. Such images conjure up classic park scenes. But something else is popping up in the UK’s public spaces alongside children’s play areas – exercise bikes, high bars and cross trainers for adults. So what is behind this trend? Outdoor gyms – or adult playgrounds – have been growing in popularity in recent years. The Great Outdoor Gym Company (GOGC) was one of the earliest companies to specialise in providing the equipment in the UK. Launching in 2007, they drew inspiration from the Chinese government which was installing outdoor gym equipment in parks. The London borough of Camden has nine outdoor gyms – the most of any local authority area in the UK. 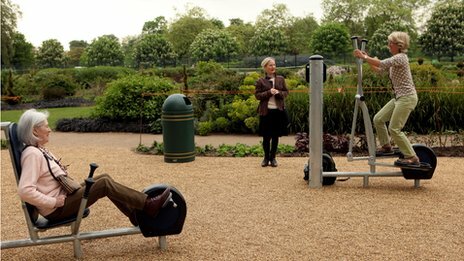 The council cites research suggesting that 26% of those who were using the outdoor gyms had never exercised before. Pennine Playgrounds has been designing sites aimed at adults for four years, says director Vicki Braithwaite. The run-up to the Olympics and Jubilee has seen a surge in demand, she says, with orders for outdoor gym equipment up 1,200% in 2012. Adult playgrounds are a classic example of the “nudge” thinking that has infiltrated government on both sides of the Atlantic. The main idea behind nudge theory is that humans are innately lazy and are more inclined to take the default choice. The “nudge” is something that is intended to gently guide us into the right direction – whether that’s for our own good or to improve society. “Nudging never involves making anyone do anything they do not want to do nor does it involve telling people what to do,” says Richard Thaler, who co-wrote Nudge: Improving Decisions About Health, Wealth and Happiness. People don’t like being told what to do and so often don’t respond well to advice even if it is well-intended. The Department of Health recommends adults participate in 150 minutes of physical activity each week and yet many Britons do not achieve this on a weekly basis. If a council focuses all of its exercise promotion strategy on leisure centres it faces obstacles – there are not many centres and some people can find them intimidating places. The idea of an outdoor gym is to place it in people’s way. They are often installed next to kids’ playgrounds, thus encouraging parents to use the fitness equipment while their children play. Even for those without children, placing them in parks and other open spaces that people cut across on the way to the shops or work is the essence of the “nudge”. Putting them in the way has the potential to create regular users. The usual tactic of advertising the health benefits of exercise and then expecting people to motivate themselves for a trip to a sports centre, gives way to a more subtle approach. Elderly users are particularly targeted by some of the adult playgrounds, but most have users of all ages. Margot Bloom, 42, found herself using her local adult playground in Southampton. “I am able to do resistance training as a part of my dog-walking routine. Runners stop to use it and serious body builders use it to top off their workout. The sterile conditions of a gym, not to mention the fear of embarrassment they can instil in those wanting to get fit, is an obstacle for many. But, as Darren Putt, personal trainer and director of Motus Training observes, there isn’t the same association with outdoor gyms. “Play, by definition, is characterised by child-like activities, fun and spontaneity and therefore requires no planning or organisation. “Adult playgrounds help to overcome the problem that exercise has become a chore for many – few people find plugging away on the treadmill a pleasure. Andy Sturtevant, 33, who has been using the adult playground in north-west London once or twice a week for the past year, is another convert. He gave up his gym subscription because of a squeeze on his salary in the recession and soon found outdoor gyms were in any case more enjoyable. “Adult playgrounds are much better – fresh air, no televisions blaring and a better mix of people. You’re more likely to meet Maureen from Meals on Wheels, as I have, at the outside gym than Steve on steroids in the gym. Talking of trends, what’s next for the adult playground? The first of these “eco wellness” zones in the UK opened in Shaw Park, Hull, last week. More nudging is likely to follow.